Yesterday, I was feeling under-the-weather enough that I stayed home from work and skipped my evening class. So for dinner, I wanted soup. Luckily, I had a quart of clam broth leftover from a recent clam bake at my parents house. I also wanted something healthy. Therefore, I knew this soup was the perfect place for the every-so-slightly wilted kale I had from our CSA pick up this past Saturday. Kale is full of fiber, vitamin A, vitamin K, and tons of other vitamins and nutrients. 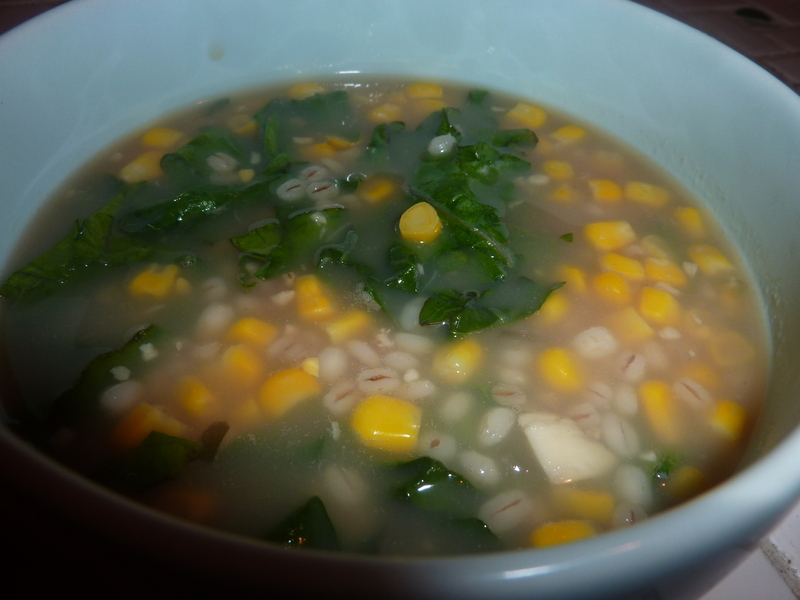 Some leftover corn cobs (and frozen kernels) served to lend a hearty sweetness and substance to the broth. Finally, whole grains in the form of pearled barley are also a wealth of healthy goodness. 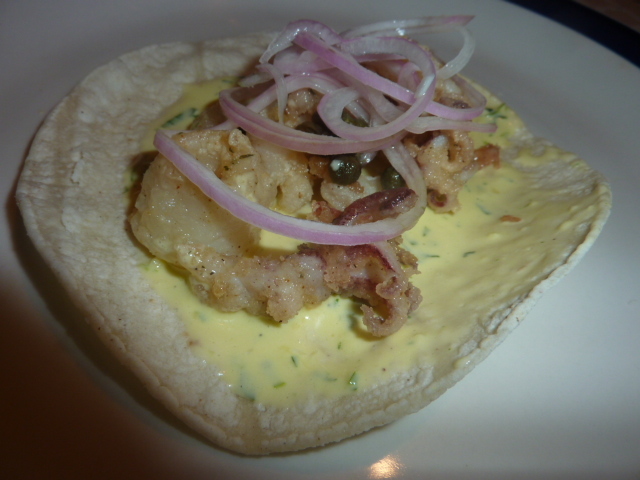 But the healthiness of this dish isn’t the main attraction – it’s the taste. The briney broth is infused with the sweetness of the corn, a slightly bitter herbaceousness from the kale, and a toothsome texture from the barley. Zak bumped it up a notch by adding a leftover artichoke heart stuffed pepper. I was happily surprised by how hearty and good this clam and corn soup was without the addition of any cream. It still had all the lovely flavors of a chowder, but was more of a hearty soup or stew due to the lack of cream. Add clam broth and corn cobs to a medium stock pot. Bring to a simmer over medium-high heat. Add barley and cover. Simmer over medium heat for forty five minutes to an hour, until barley is tender. Add corn and kale. Simmer 3-5 minutes until corn is heated through and kale is wilted. Serve immediately. This seared tuna was a very special treat for us. Though we often throw out tuna steaks as an option when we’re headed to the store to buy some fish, ahi or yellowfin tuna can be almost prohibitively expensive. These tuna steaks were pricey, but they were so fresh looking and smelling that we couldn’t resist. It is extremely important when you are searing tuna to choose fresh, high quality fish. 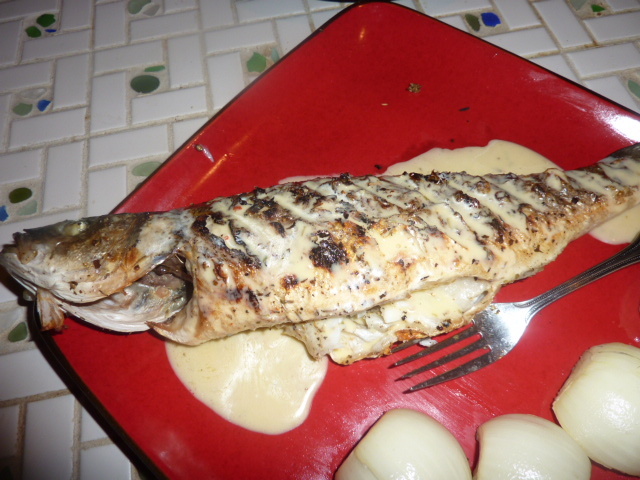 The center of the fish remains raw, so you have to be confident in your fishmonger to feel comfortable eating it. Because the high quality fish was intended to be the star of this plate, I kept the marinade fairly simple – some ponzu, a bit of sesame oil, and a few aromatics. All of the flavors are present in the finished dish, but the predominant flavor is that of ocean fresh tuna. Served with some simple spinach and white rice, this was a delicious, healthy, and filing meal. 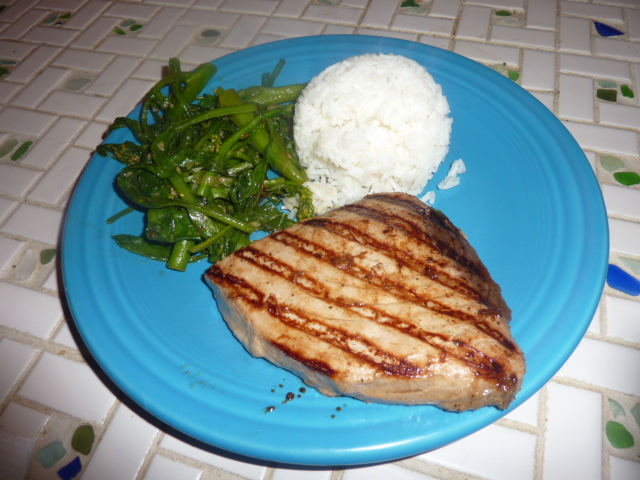 2 yellowfin tuna steaks (also known as ahi tuna), each weighing approximately 1/2 lb. Whisk together ponzu, sesame oil, scallions, garlic, ginger, and black pepper. Place tuna steaks in a large ziplock bag and pour marinade over. Marinate at least an hour, turning often to ensure even marination. Coat either a cast iron grill pan or cast iron skillet with canola oil. Heat over high heat until oil is shimmering and a drop of water placed on the pan evaporates. Place tuna on the grill. Cook roughly one minute and fifteen seconds per side per 1/2 inch of thickness to ensure a seared outside and cool center.